Hello guys, now here it is another custom recovery for Samsung Galaxy V SM-G313HZ Android phone, TWRP or Team Win Recovery Project. 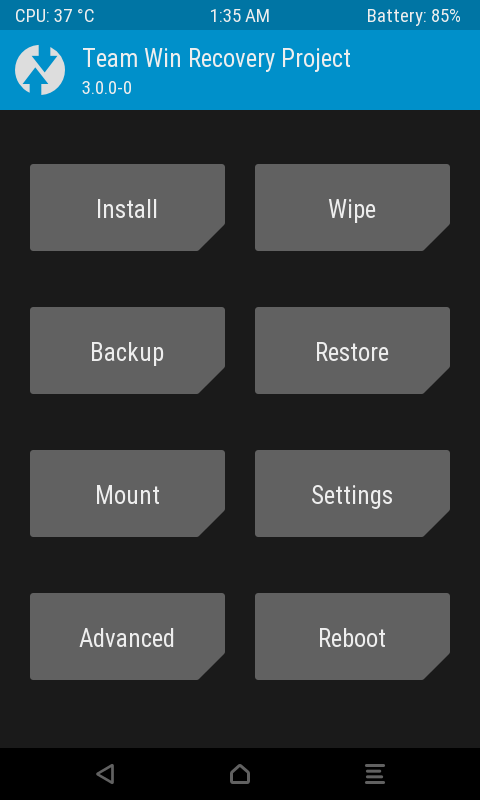 And also, this is my best preference custom recovery and I am using it untill now on my Samsung Galaxy V Android phone. Fully touch support, so no need to press buttons again to operate it. Ability to choose what partition should be backed up, is it all (full nandroid backup), data partition (/data) only, system partition (/system) only, etc. It is very usefull when we are going to make specific mod just to specific partition, so we just need back up that partition only thus will give up fewer time and faster backup creation speed. Ability to switch storage preference between internal storage or external storage when we want to make a backup or restore from a backup. Ability to install image (.img) file. And some of custom ROM's created for Samsung Galaxy V also will require us to install them using TWRP recovery at least version 3.0.0.0, as the CWM I shared on previous post is not fully supported. This TWRP recovery for Samsung Galaxy V SM-G313HZ is still created by same developer who brang us the CWM recovery, cleverior.ipul. You can find info about him on the XDA forum, and once again don't forget to thanks to him :D .
Any custom recovery installed. Because this TWRP is made as flashable zip. Make sure you know how to fix if something bad happens to your device (reinstalling your device stock firmware, I mean). Boot your Samsung Galaxy V SM-G313HZ device into recovery mode. Just straight install zip of the TWRP flashable zip and wait untill the process done. Done! Reboot your Android device, or you can also reboot again to recovery to see if your TWRP is work on your Samsung Galaxy V Android phone. How to install CWM recovery without PC for Samsung Galaxy V SM-G313HZ. How to root your android device using 360 Super Root app. How to root your Android device using Root Dashi app. Comments (0) in "Team Win Recovery Project (TWRP) Custom Recovery for Samsung Galaxy V SM-G313HZ"